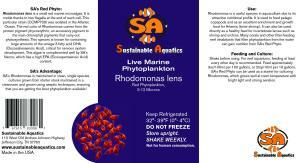 Rhodomonas lens is a small red marine microalgae. It is motile thanks to two flagella at the end of each cell. This particular stain (CCMP739) was isolated in the Atlantic Ocean. The red color of Rhodomonas comes from the protein pigment phycoerythrin, an accessory pigment to the main chlorophyll pigments that carry-out photosynthesis. This species is known for containing large amounts of the omega-3 fatty acid DHA (Docosahexaenoic Acid), critical for nervous system development. This algae is complimented well by SA’s Nanno, which has a high EPA (Eicosapentaenoic Acid) content. 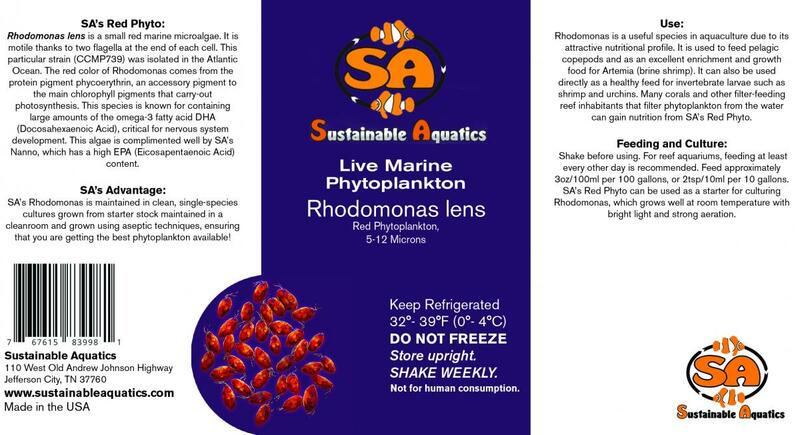 SA’s Rhodomonas is maintained in clean, single species cultures grown from starter stock maintained in a cleanroom and grown using aseptic techniques, ensuring that you are getting the best phytoplankton available. Shake before using. 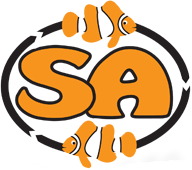 For reef aquariums, feeding at least every other day is recommended. Feed approximately 3oz/100ml per 100 gallons, or 2tsp/10ml per 10 gallons. 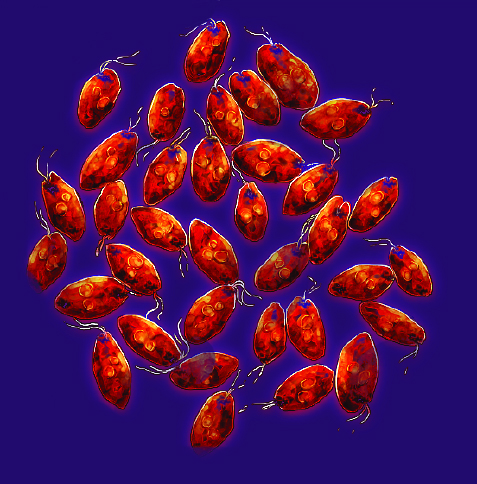 SA’s Red Phyto can be used as a starter for culturing Rhodomonas, which grows well at room temperature with bright light and strong aeration.